I’ve been eagerly anticipating the first collection of Eleanor Davis’ work since I stumbled upon her illustration work for Google and the New York Times. Still being fairly new to the indie comics scene, I hadn’t realized how much of her work was available online or in various anthologies. On the whole, this is my loss, but seeing all of her comics with a fresh eye was important for me. It gave me a chance to evaluate her work in a more holistic way. How To Be Happy is 152 pages of a mix of full color (104 pages) and black and white (48 pages) comics from a range of Davis’ comics history. Included are pieces from Mome and Nobrow, as well as previously published work from her website. One thing that is immediately clear when flipping through the collection is Davis’ eye for color. In a color-blocked style, “In Our Eden,” her lead off piece, is both engaging and beautiful in its construction. 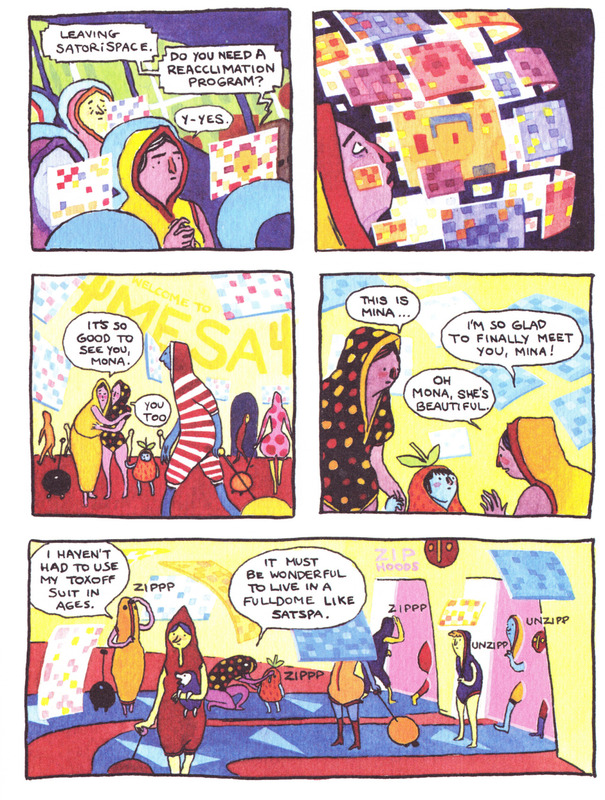 The second major comic, “Nita Goes Home,” is likewise remarkable in its use of color. Both of these comics set the stage for the overarching theme of these short comics. Davis notes in the book’s opening pages that “this is not a book about how to be happy,” and I agree. How to Be Happy is a book that shows people living with despair, grief, and unhappiness. It is a book about how people fail and sometimes succeed in calming the harsh storm inside ourselves. Davis’ work is on a really stark emotional spectrum – and while her giant grinning men are a joy, it is in the tears of her characters where we find the most of her message. 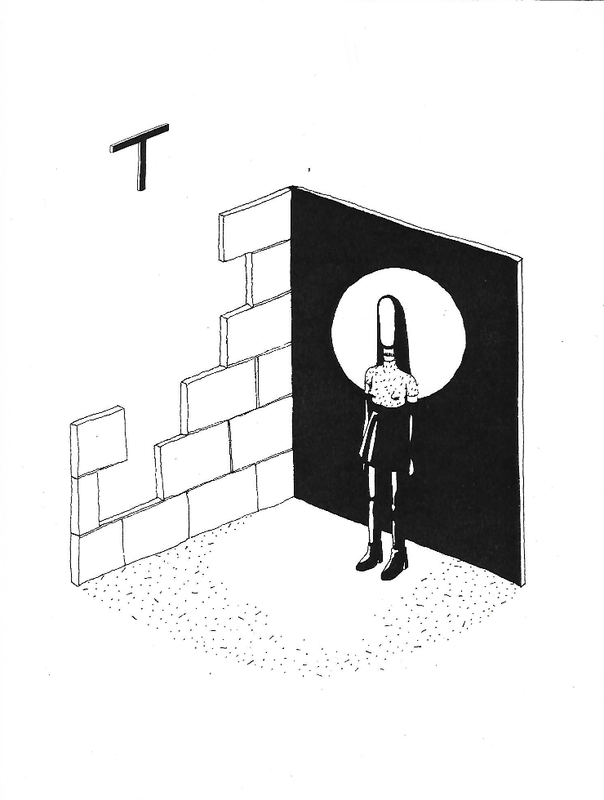 In the last long color comic “No Tears, No Sorrow,” we find characters distanced from the world and unable to cry. They decide to go to a seminar to return their lost tears. What the main character finds is the inability to separate her own personal sadness from the collected sadness of humanity as a whole. We close the comic with a scene of her sobbing relentlessly in an aisle of a grocery store. Dealing with sadness, understanding it, and coming to terms with it, is a thematic concept that drives How To Be Happy. 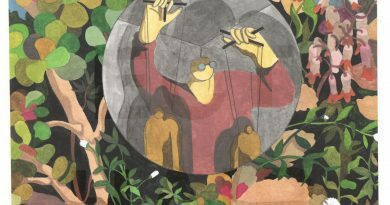 In the lead off comic, “In Our Eden,” a group of people is slowly whittled away from as the leader abandons an agrarian lifestyle, then commercial products and hunting. In the end, it is just one Adam and one Eve, together in their Eden. In some ways, this comic shows us success and failure at the same time. As Adam drives the nonbeliever away with his more and more radical notions of Eden, he and Eve are isolated from their community – but they have each other. Building communities and maintaining them is also an important theme that builds throughout How To Be Happy. Of all the work in How To Be Happy, Davis’ black and white comics are the most savage. In a series of two panels, Davis shows a man in a Mickey Mouse t-shirt snip off his lover’s fingers in the way that a person might lance a boil – at arms length away, squeamishly, and without emotion. In one of the shorter black and white comics, a husband and wife come to terms with their failed relationship. “Any kindness I’ve ever shown has been in my own self-interest,” she says, and he responds with, “The very existence of other people seems doubtful.” Their solution is catastrophic and biting. 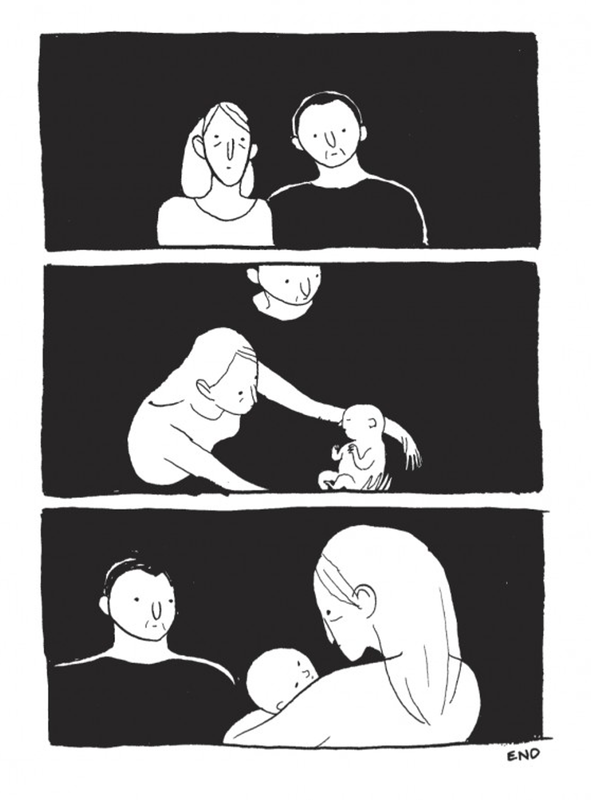 I love how Davis separates the couple in individual panels, showing their isolation. But after the baby comes they stand together in failure, clearly not any different than before and now connected by something they cannot manage. At the beginning of the book, we see a group of people falling from the sky as one lone woman tries to catch them all. At the end, we see a group of people trying to catch one person. The fall is inevitable, but community can make it bearable, survivable. Davis’ work is a fierce but beautiful reminder that humanity has within it the disease, and sometimes, it also has within it the cure. Recommended. Eleanor Davis is a celebrated comics artist and illustrator. Her work can be found at her website, her sketch blog, and also at her tumblr – beouija. 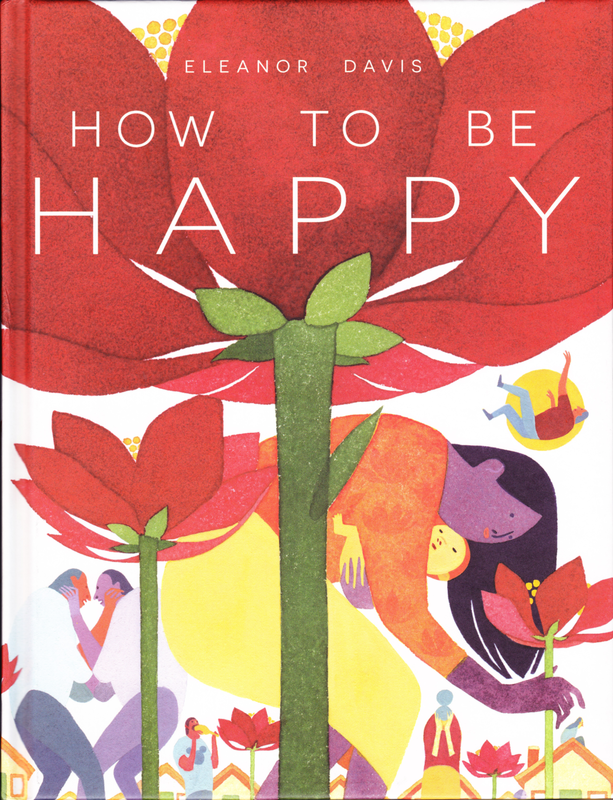 How To Be Happy is published by Fantagraphics (tumblr: fantagraphics) and can be purchased at their website or from your local independent bookstore.